When I get into the frame of mind to go back to my culinary roots, I always go to recipes that are really representative of southern farmhouse cooking, and what’s more southern than fried chicken? It’s a standard. It’s a staple. And, most of all it’s quick and easy. That’s right, I said “quick and easy.” Making my Real Simple Fried Chicken is not a production. It does not require overnight marinades or special equipment or any kind of fancy preparation whatsoever. If it did, do you think millions of southern women would have cooked it for lunch every day for years and years? I can tell you without hesitation that they would not have. For our southern grandmothers, it was something they could whip up in a few minutes. I’ve seen the recipes and the demonstrations where chefs put the chicken in milk or buttermilk or yogurt and let it stand overnight in the refrigerator. Then they coat it in all kinds of seasonings and shake it all up together in a paper bag. Well, that’s fine if you really want to do that, but what you typically get from that is a big mass of fried flour with a little bit of chicken in the middle of it. The best fried chicken is made with a chicken that weighs about 3 pounds. That’s pretty hard to find in today’s supermarkets especially when chickens have been bred for more breast meat, and that makes them weigh more. Try to at least find the lightest weight bird in the case. If you have the skill to do so, buy a whole chicken and cut it up yourself. You’ll save lots of money. I, unfortunately, do not have that particular skill. Wish I did. I’ve tried. I’ve tried a lot. 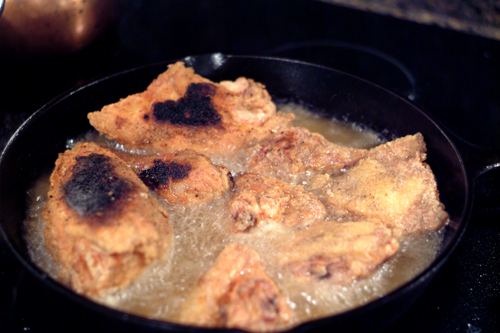 Here’s how I (and millions of southern women before me) make really simple fried chicken. Wash and thoroughly dry all the chicken pieces and place them in a single layer in a pan. Liberally salt and pepper the chicken pieces on both sides. Be very generous with the pepper. The taste of pepper is very important to authentic southern fried chicken. If you want to sneak in some other seasonings, this is the time to do that. Sometimes I sprinkle on some Lawry’s seasoning salt or some Jane’s Crazy Mixed-Up Salt. Whatever floats your boat. But if you’re a purist, you’ll stick with just salt and pepper. Sprinkle all the flour over the chicken in the pan and toss the chicken to coat it well in flour. We’re talking about “dredging” here, not lightly flouring. That’s why you pour the flour over and toss the chicken in it rather than doing that shake-it-up in the bag thing. You want a good coating of flour. Meanwhile, heat the peanut oil in a large iron skillet. 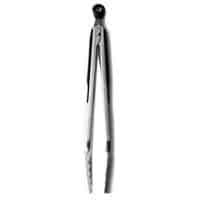 You’ll want oil to a depth of about 1/2 inch. What we’re doing is pan frying, not deep frying. You need enough oil to come about halfway up the pieces of chicken, but not so much that it will spill over when you place the chicken in the pan. 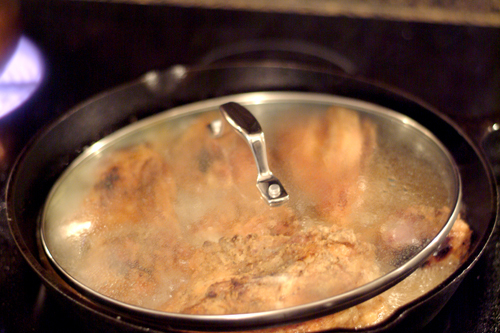 Using a well-seasoned iron skillet makes a huge difference in the taste of your chicken. 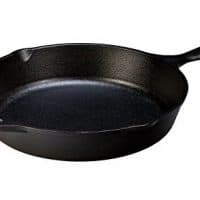 Just something about a great iron skillet that you can’t get from any other piece of kitchen equipment. Also, I recommend using peanut oil because it will withstand higher temperatures for a longer time without burning than other oils. 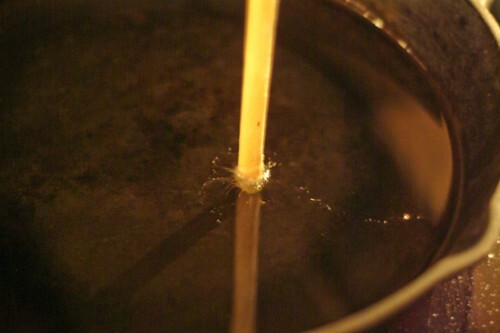 A little trick to test whether the oil is hot enough to cook — Place the end of a wooden spoon in the skillet. If the oil bubbles around it, it’s hot enough. Place the chicken pieces, skin side down in the hot oil. Cook for approximately 10 minutes or until the skin is pale golden brown. Turn the chicken over and cook for 10 minutes on the second side. What? You say it’s burned? Hmm. Well, a couple of pieces are a little dark, I suppose. Oh, bless your heart…you thought it was going to look like Kentucky Fried Chicken, didn’t you? Let me tell you a secret. Those dark pieces will be the best tasting ones of the whole chicken. Trust me on that. Turn the chicken pieces once more, reduce the heat to medium low, cover and cook approximately 10-15 minutes or until chicken is cooked through. Please excuse my improvised lid in the picture. I don’t happen to have a lid that fits my largest iron skillet, so I improvised with the largest one I did have. Works fine. Remove the hot chicken to a paper towel lined plate and allow to drain for about 5 minutes. If you try this method once, I’ll bet you won’t go back to all that complicated marinating and shaking. It’ll be the crispiest, most flavorful chicken you’ve cooked in a long time or my name isn’t Nana. I’m not making any kind of promises about what the clean up is like, however. Wash and thoroughly dry chicken pieces and place in single layer in pan. Liberally salt and pepper chicken pieces on both sides. Sprinkle flour over chicken in pan. 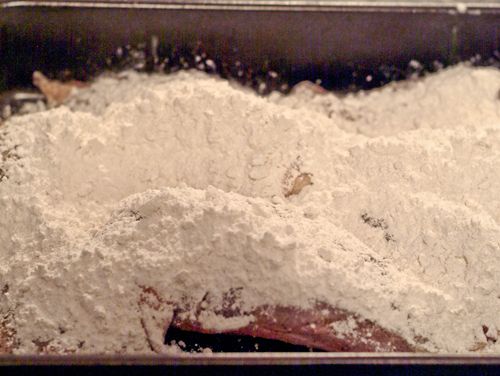 Toss chicken to coat well in flour. Meanwhile, heat peanut oil in a large iron skillet. Place chicken pieces, skin side down in hot oil. Cook for approximately 10 minutes or until skin is pale golden brown. Turn chicken over and cook for 10 minutes on second side. Turn chicken pieces once more, reduce heat to medium low, cover and cook approximately 10-15 minutes or until chicken is cooked through. Remove chicken to paper towel lined plate and allow to drain for about 5 minutes. Good golly Miss Molly!!! This is Mama reincarnate. For heaven’s sake, don’t tell her. I had lunch with her and Polly today, and it was all in rare form. 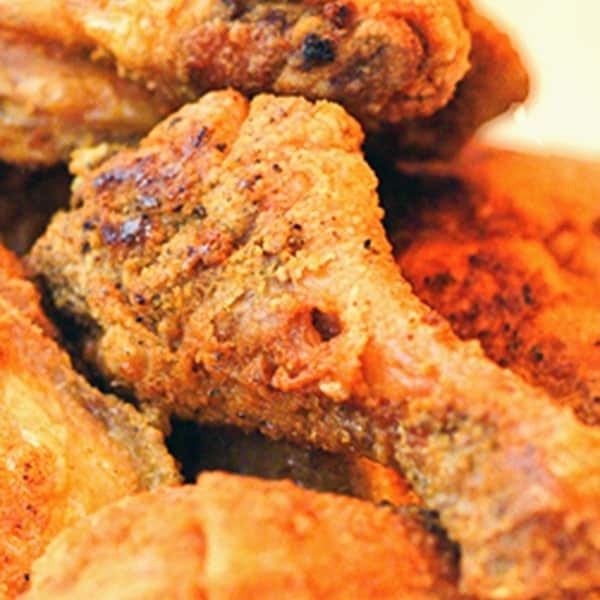 Okay, the real truth here — Mama’s fried chicken is hands down, the best in the whole world. None of that nasty goopy flour mess stuck to the chicken. Just a light crunchy crisp of a coating. And, you are right — the extra brown pieces are the ones that will be first off of the platter. Looking at your fried chicken, you are running a close second. Maybe gaining on Mama. Again, don’t tell her. Will you come and cook this for me? And Uncle John? He will be the first to tell you that I did not get the immaculate frying gene. yum…No can resist the power of fried chicken. The skin looks nice and crispy. I’m lovin’ it. I’m craving for some right now. that’s a classic….with extra pepper it is super yum…..te self raising flour is a new addition for me, i make it with AP or cornmeal(whenever available).the frying tip is very nice. Just like my mama used to make. Thanks! Thanks everyone for the gracious comments! Glad you enjoyed the post! 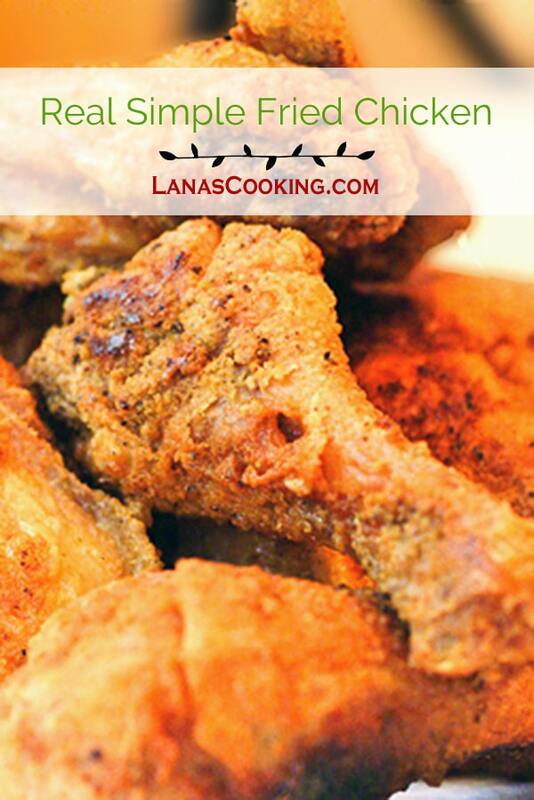 Thank god someone finally published a REAL fried chicken recipe! This is how I learned how to fry chicken from my Grandmother however I dont use the skillet much anymore and actually use a deep fryer. Otherwise my recipe is exactly the same. This turned out so deliciously. I love fried chicken but I’ve always felt compelled to soak the chicken in buttermilk or milk before frying. Now this allows me to make fried chicken whenever I want! Thank you so much for this recipe and instructions! I was orphaned as an early teen and was never taught certain basics like fried chicken, and as I got older I surfed the internet for fried chicken recipes and techniques to learn how, but my fried chicken was always burnt before the center was cooked, or too soggy, or hard as a rock. I could never make good fried chicken and so gave up until today, when I thought I’d give it one more try after reading your method, and I’m so happy I did because it came out perfect! Thank you again! Omg I am just learning to cook and found this recipe.all I can say it wow!! !the chicken came out just how I like it.seasoned well and niCe and crispy. Thank you so much!!! What temperature are you cooking at? And by that I dont mean 350 or ect. Lol I mean at first are you heating up the oil on high or med? Because I know some people that keep it on med the whole time but others turn it on high first thing till the oil is hot enough and then turn it down to med to keep a steady temperature and then go to low at the end. I just wanted to know how your doing it? Love the clear intructions, and it looks awesome!! I usually start it at a medium-high setting. Not too high because the cast iron holds the heat so well that you don’t need the highest setting. I adjust it as I cook to keep a fairly steady temperature. When the first pieces go in it always needs a little bump up because the cool food lowers the oil’s temperature. Honestly – I just do it by eye and sound. I’ve been cooking fried chicken so long I can actually hear when it’s done. Not joking. So I had a huge problem when trying! all the flour fell off! how do I prevent this in the future? I use boneless skinless chicken breasts. Use a whole cut-up chicken with the skin still on it and make sure you dry it with paper towels. This is so similar to my tried and true recipe Lana and it’s so good I’ve never messed with a bunch of ‘new fangled’ ways to cook it either! The only other step I take is to fry it for a minute or two on each side at the end to insure the skin is really crispy. Which is important to me. Why? Seriously give me a big pile of fried chicken skin and you can have the meat. Ask my siblings; I used to steal it from their plate! It was my father-in-law who taught me how to fry chicken when I was newly married. He used the very same method and you’re right… it’s the easiest way to make it. Only one other step. 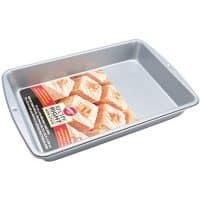 We always placed the cooked pieces on a cookie sheet with a rack in the oven. The grease drained off in the oven. If you were cooking a large batch it kept everything warm as well as draining the excess grease off. The end result is still juicy and tender. I have found a way to eliminate the messy cleanup, but it’s a bit pricey. I recently bought an Induction Top stove. You can put tea towels or paper towels all over the top of the stove and since there is no direct heat, they don’t burn. When you’re done cooking, toss the paper towels and the stove is shiny clean. Works every time. This recipe and method is just like grandma taught momma and momma taught me. Momma always wanted to start with a whole chicken also and said that it is the bones and skin that flavor the oil and of course we used to use lard. Then pour off most of the oil, add a little more flour and milk. Got to have that chicken gravy. It is better to drain on a paper bag. Well, Lana, my northern mama used to make (southern) fried chicken *until* my father had a ruptured ulcer, and that was way back when I was just a babe. She stopped making all fried or spicy foods, and moved towards canned soup based meals more and more through her busy years…. (I’ve had a lot to overcome in my cooking life…..). I’ve read about frying chicken, but I’ve never wanted to go through ‘all the trouble’ of it. But now!? – With your lovely description of easy fried chicken, you’ve done it again! It’s time for my to teach my daughter something else I’ve never mastered! =] But this time, I’m all for the joy of it (not the laugh of the pastry crust falling apart again — probably… haven’t quite got there yet……). I do hope it works out well for you! Let me know! Add a little cayenne pepper to that flour and I’m in heaven….it won’t make the chicken spicy but it does bump up the flavor just as it does in cheese sauces. It’s a little burnt but would still be good. Maybe a lower temp or check more often. Yes, I addressed that in the text of the post.